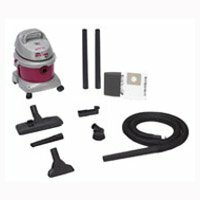 12 Gallon 5.0 PHP Wet/ Dry Vacuum with builit-in PUMP feature. This vacuum comes with an 8' x 2.5" locking hose extension wands and floor nozzle. Filters include Cartridge Foam and Dry Collection Bag This item cannot be shipped to APO/FPO addresses. Please accept our apologies. 2.5 Gallon 2.5 PHP Motor Wet Dry Vac. 18' Power Cord. Lightweight Poly Tank. Deluxe 1.25" cleaning tools with "Flip Nozzle" for bare floors and carpeting. Round brush crevice and gulper tools 7' x 1.25" locking hose. Foam Filter and Collection Bag. This item cannot be shipped to APO/FPO addresses. Please accept our apologies. 2.5 Gallon 2.5 PHP Motor Contractor Dry Vac. 6' Power Cord. Lightweight Poly Tank. Includes 1.25" cleaning tools 4' hose Crevice tool Utility nozzle Wall mount bracket foam sleeve Ultra Web cartridge filter and filter bag. This item cannot be shipped to APO/FPO addresses. Please accept our apologies. 4 Gallon 5.5 PHP SVX2 High Performance Motor Wet Dry Vac. 18' Power Cord. Lightweight Poly Tank with built-in tool basket. Deluxe 1.25" cleaning tools with "Flip Nozzle" for bare floors and carpeting. Round brush crevice and gulper tools 7' x 1.25" locking hose. Cartridge Foam Filters and Collection Bag. This item cannot be shipped to APO/FPO addresses. Please accept our apologies. The Shop-Vac 16 Gallon 6.5 Peak HP SVX2 Contractor Series Wet Dry Vac comes works great for job site cleanup workshops garages basements - anywhere you need a wet dry vac with power. This item cannot be shipped to APO/FPO addresses. Please accept our apologies. The Shop-Vac 6 Gallon 3.0 Peak HP SVX2 Contractor Series Wet Dry Vac works great for job site cleanup workshops garages basements - anywhere you need a wet dry vac with power. This item cannot be shipped to APO/FPO addresses. Please accept our apologies. The Shop-Vac 18 Gallon 6.5 Peak HP SVX2 Contractor Series Wet Dry Vac works great for job site cleanup workshops garages basements - anywhere you need a wet dry vac with power. This item cannot be shipped to APO/FPO addresses. Please accept our apologies.